This is great with thick tortilla chips. Break out of the jarred salsa rut with this easy, quick and totally refreshing version that will take you just 5 minutes to mix up. It's a perfect party take-along! With just four ingredients, Quickie Pineapple Pomegranate Salsa isn’t your run-of-the-mill salsa. 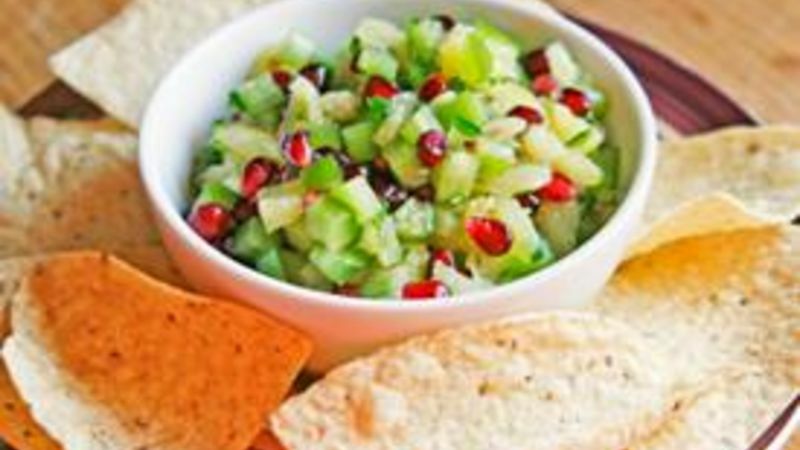 It’s a sweet-spicy combo that's perfect with good, thick tortilla chips -- the kind of chips that are substantial enough to stand up to this fresh homemade salsa. As for the heat factor, this is a salsa that you can make as spicy as you like. It all depends on the hot pepper you use. I make mine with jalapeno pepper, but you could make it super hot with a spicy pepper like a habenaro, or milder with a less spicy pepper like an ancho pepper with the seeds removed. Just be sure to choose wisely – and keep your guests in mind when you're spicing up your mixture. So, what else can you do with this easy salsa that's ready in just 5 minutes? Try it on grilled or roasted chicken. Spoon a little over a cheddar omelet. Top your fish tacos with it. The possibilities are endless. As for me, I’ll just be eating it the classic way -- with tortilla chips. Yum!